Stop by the Far West Fungi stall at the market to explore an amazing array of organic mushrooms. They are happy to share recipe ideas and give advice for how to use their more exotic mushroom varieties. 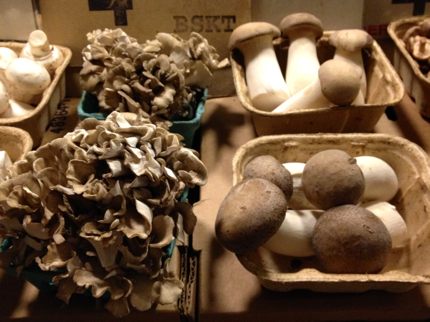 For this week’s mushroom quiche, they recommended creamy, buttery king trumpets and firm, crunchy maitakes. To round out the mushroom flavor, we also tossed in some earthy crimini mushrooms. 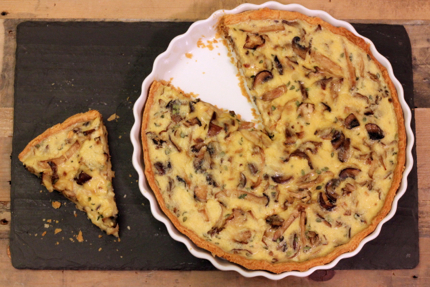 The mushrooms in this quiche are complemented by mild, creamy Broncha cheese from Achadinha Cheese Company, made in Petaluma from a cow and goat milk blend. And don’t forget to pick up more ingredients for this recipe at the market, including eggs from Great Valley Poultry and shallots and herbs from Blue House Farm or Happy Boy Farms. Quiche is very versatile – serve it for dinner with a simple green salad, include it in a brunch menu, or have a slice as an afternoon snack. The full recipe is after the jump. Enjoy! 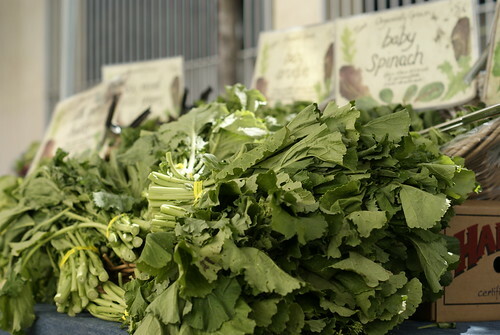 The market is a great place to stock up on organic greens! 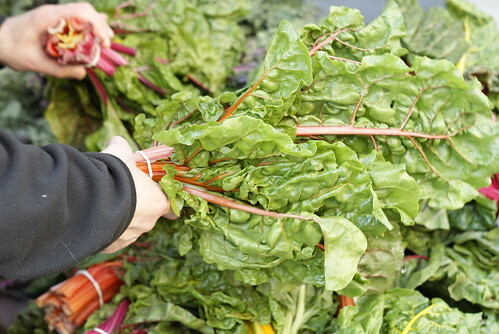 Grab a variety of healthy greens, from kale and chard to collards and dandelion greens, available by the bunch from Blue House Farm and Happy Boy Farms. And at 3 bunches for $5, it’s a great deal! 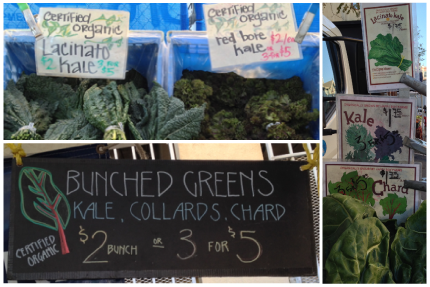 These farms also frequently sell spinach, lettuces, and beets, which usually contain free greens as an added bonus! 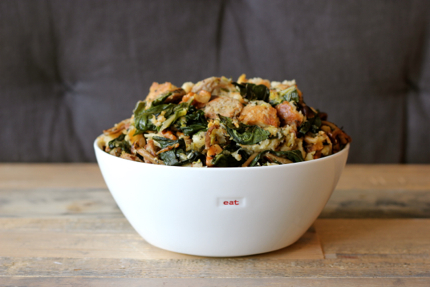 Wondering what to do with all those greens? 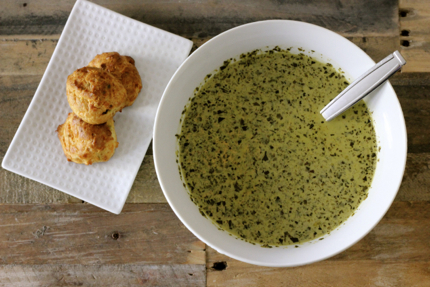 Here is a simple recipe for a creamy, tasty soup that can be made with any combo of greens you have on hand. This is a great way to make use of any leafy goodies, even if they’re approaching the end of their freshness. Made here with kale and mixed lettuces, you could substitute with one or more bunches of your choice. Full recipe found after the jump! 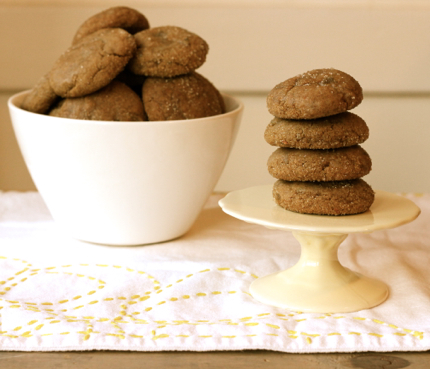 Orange zest and orange glaze add a fresh twist to these delicious ginger cookies. Pick up juicy navel oranges from Twin Girls Farm or mandarin oranges from Winters Fruit Tree to add this seasonal spin to a classic cookie. You can also make a variation substituting lemons for oranges. 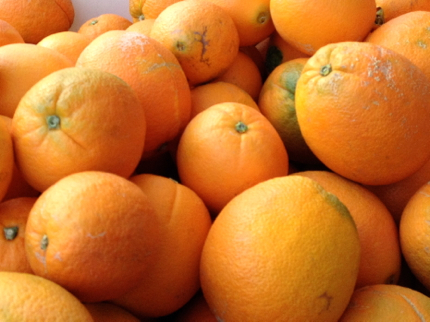 Try Meyer lemons from Winters Fruit Tree for their sweeter flavor. The addition of citrus doesn’t mean these cookies are light on ginger flavor. Each chewy bite has a zing of ginger from the addition of three types of ginger: ground ginger, fresh grated ginger, and crystallized ginger. Citrus ginger cookies are perfect for this time of year. Bake up a batch for a cookie swap or to share with friends and coworkers! And in the process fill your kitchen with the warm aroma of ginger, spices, and citrus baking in your oven. Zest the orange(s) or lemons to yield a heaping tablespoon of zest. Juice the fruit and reserve 2 tablespoons of the juice for making the glaze. Save the remaining juice for another use. Whisk together the flour, baking soda, cinnamon, allspice, salt, white pepper, and ground ginger in a large bowl. Heat the butter in a saucepan until just barely melted. Stir in the molasses, sugar, and fresh ginger. If the mixture is hot to touch, let it cool until it is lukewarm. Whisk in the egg and pour the mixture over the flour mixture. Add the crystallized ginger and orange or lemon zest. Stir until just combined. Refrigerate for at least 30 minutes. Scoop a heaping teaspoon of dough and roll into a ball, then coat in large-grain sugar. Place sugar coated dough balls a few inches apart on a parchment-lined baking sheet. Bake for 10-12 minutes, until cookies puff up, get fragrant and crack. Cool on a wire rack. Prepare the glaze by whisking together powdered sugar with 2 tablespoons orange or lemon juice. Dip cooled cookie tops in the glaze or use a pastry brush to apply the glaze. Sprinkle with more large-grain sugar. Store in an airtight container. Makes about 45 cookies. 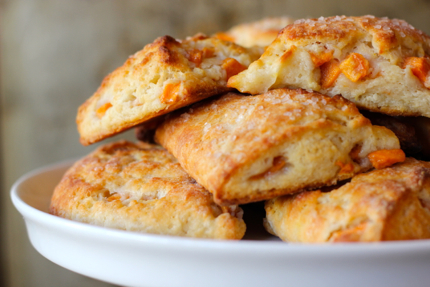 Impress your family and guests this holiday season with freshly baked scones for breakfast! 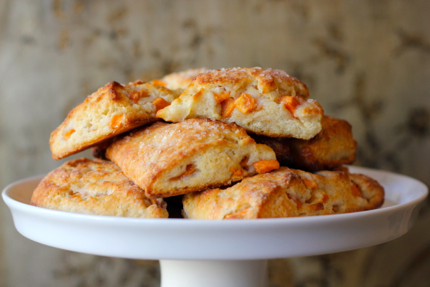 Studded with Fuyu persimmons available into early December from Twin Girls Farm and K&J Orchards, these delicious scones are sure to please. It can be notoriously difficult to incorporate fresh fruit into scones without the fruit streaking and turning to mush. That’s why you most often see scones with dried fruit. But nothing beats fresh, seasonal fruit in baked goods. This recipe from America’s Test Kitchen has great tips to make adding fresh fruit to your scones a success. 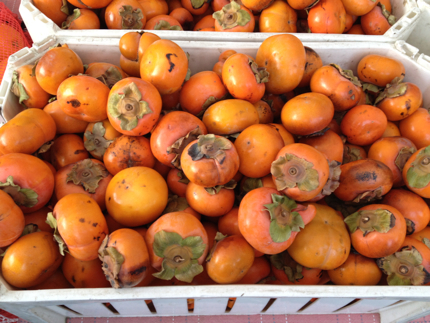 The squat Fuyu persimmons are a great choice because they are quite firm when ripe and ready to enjoy, making them easier to incorporate in the scone batter without breaking down. This recipe also has some great make ahead tips so you don’t have to get up at the crack of dawn to have freshly baked scones in the morning. 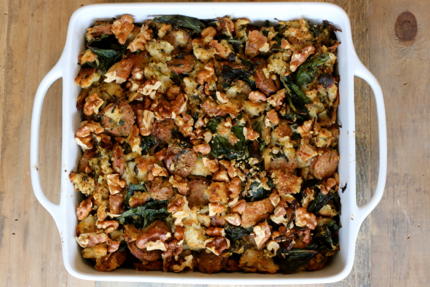 This flavorful chard sausage stuffing makes a hearty side dish at your Thanksgiving table. And it’s chock full of amazing ingredients from the market! Like tasty bread from Arizmendi Bakery, sweet and savory chicken apple calvados sausage from 4505 Meats, robust pioppini mushrooms from Far West Fungi, and toasty walnuts from Winters Fruit Tree. Plus look for fresh produce for this dish – swiss chard, leeks, garlic, and herbs – at Blue House Farm and Happy Boy Farms. This recipe comes together easily and can even be assembled up to a day in advance to save you prep time on Turkey day. It would also work great to bring to a potluck Thanksgiving. So shop at the market this week (your last chance before Thanksgiving!) and try making a new side dish this year. Cut bread into 1/2-in. slices and place in a large bowl with the milk. Mix gently to saturate with milk and let stand about 30 minutes. Stir occasionally. Slice the sausages into disks and sauté over medium high heat in a large pot, until lightly browned. Add leeks and sauté until slightly wilted. Add garlic, parsley, and mushrooms. Cook, stirring often, until vegetables are lightly browned, 5 to 8 minutes. Add chard and 1/3 cup water and cook, stirring often, until wilted, about 5 minutes. Squeeze the soaked bread with your hands and break into tiny pieces. Add the cooked meat mixture, parmesan, basil, sage, and walnuts. Stir to combine. Season with salt and pepper to taste. Transfer to an 8×8 inch casserole dish. For moist stuffing, cover with foil. For crusty stuffing, do not cover. Bake until hot (at least 150 degrees in center) or lightly browned, at least 30 minutes. Tips for making in advance: you can make the stuffing, put in the casserole dish and chill up to 1 day in advance. Allow about 1 hour to bake.